The Indian Mutiny is also known as India's First War of Independence, the Great Rebellion, the Indian Rebellion of 1857, the Revolt of 1857, the Uprising of 1857 and the Sepoy Mutiny. The Bengal Yeomanry Cavalry was a volunteer force raised in July 1857 after the outbreak of the Indian Mutiny and disbanded in 1859. The Meerut Light Horse was a volunteer unit formed in 1857 at the outbreak of the Indian Mutiny. Also known as the Meerut Volunteer Horse and the Meerut Volunteer Cavalry, which had originally been formed as the District Volunteer Force. It was disbanded in 1861. The Camel Corps was formed at Lucknow on 5 April 1858 from drafts of 100 men each from the 2nd and 3rd Battalion, The Rifle Brigade, to which were eventually added 200 Sikhs. The Camel Corps was used in 1858 and 1859 to support columns of soldiers despatched during the latter stages of the Indian Mutiny to hunt down groups of rebels that had fled into the countryside of Rohilkund and Oudh, and was disbanded on 1 June 1860. Available at the British Library is the publication, Casualty Roll for the Indian Mutiny, 1857-59, compiled by I. T. Taverner, published by J. B. Hayward & Son (1983), Suffolk, England (ISBN: 0 903754 98 3) pp.205. It contains name, rank and regimental number of every casualty (fatal or otherwise) of HM's (incl. Naval Brigade) & HEIC forces (by Presidency, incl. Indian Medical Service and Ecclesiastical Establishment); location and date where/when/how injured. A useful chronology of the Mutiny events and bibliography is appended. Memorials of the Indian Mutiny Online site listing soldiers of both British and HEIC regiments who were killed during the Mutiny. Chapter One "The English East India Company's Conquest Of India 1757-1849" Chapter Two "The Causes Of The Rebellion" Chapter Three "Political and Military Situation from 1839 to 1857" and Chapter Four "The Bengal Army and The Military Situation -1857" Chapter Five "Development of Situation-January to July 1857". Further chapters may be seen under particular campaigns. "Mutiny or War of Independence? Determining the True Nature of the Uprising of 1857" by Dr. Javed Iqbal Pakistan Journal of History and Culture Vol.XXXI No.1 Jan-Jun 2010. Leigh and District History: Indian Mutiny 1857-1858, now an archived webpage. Personal accounts from soldiers in India, sent to family in the Leigh District, Greater Manchester, England. The account by James Ramsdale, stated to be of the "14th Battalion Royal Infantry", appears to be a transcription error - it is considered he was actually in No. 3 Coy/14th Bn. Royal Artillery. "Counter-Insurgency in the Bombay Presidency during the Mutiny-Rebellion, 1857" by Bruce Collins, British Journal for Military History Vol 1, No 2 (2015). bjmh.org.uk. "The rising in the south" by Suryanath U Kamath Sunday, May 20, 2007 Deccan Herald. The 1857-58 uprising in Karnataka, which continued till 1859. A selection of lithographs from The Campaign in India 1857-58. From Drawings Made During the Eventful Period of the Great Mutiny, by G.F. Atkinson Illustrating the Military Operations Before Delhi, and Its Neighbourhood. 26 lithographed plates, published 1859. National Army Museum. Click on images to enlarge. Rifle Brigade In The Camel Corps rgjmuseum.co.uk. Bulletins and other state intelligence. Compiled and arranged from the official documents published in the London Gazette. These volumes, mainly the middle six, include information about the military events and contain lists of casualties during the Indian Mutiny. (refer FIBIS database, above) Published in these volumes 1859-1862. Google Books. The London Gazette Extraordinary Wednesday, February 17, 1858, (page 811) consisting of 34 pages relating to the Indian Mutiny. Includes "a complete nominal roll of officers, members of the Uncovenanted Service, and women and children of the garrison of Lucknow" (page 839). This link  advises there were corrections in subsequent Gazettes. Annals of the Indian Rebellion, 1857-58 (attributed to ‪Noah Alfred Chick). Published at Calcutta 1859. Google Books. It appears this book may originally have been published in monthly parts. Another edition includes the title wording containing narratives of the outbreaks and eventful occurrences, and stories of personal adventures, during the Mutiny of 1857-58. The Sepoy Revolt : a Critical Narrative by Lieut.-General McLeod Innes.1897 Archive.org. Map Shewing Different Mutinies and 7 further maps. Lacks maps, but pages may be easier to read Archive.org. Second edition 1897 With a second Preface. Archive.org. The History of the Royal and Indian Artillery in the Mutiny of 1857 by Julian R J Jocelyn 1915 is available in a reprint edition, which in turn is available online on the Ancestry owned pay website fold3 (located in World War II/Military Books/India). “A very remarkable narrative, containing better tables and orders of battle, than any other book published. It is as interesting for its general as it is for its artillery record.” (Statement by Sir George MacMunn, 1931, refer his book below). A History of the Indian Mutiny; reviewed and illustrated from original documents by G W Forrest CIE 1904-12 Archive.org Volume I; Volume II; Volume III, Central India. An account of the mutinies in Oudh and of the siege of the Lucknow Residency; with some observations on the condition of the Province of Oudh and on the causes of the mutiny of the Bengal Army by Martin Richard Gubbins, Bengal Civil Service, Financial Commissioner for Oudh. 2nd edition, with additions; Third edition, with further additions. Also 3rd edition better text, but lacks images. 1858 Archive.org. Selections from the Punjab Government Records. Series edited by A. Raynor and H. R. Goulding. Volumes 7 and 8 are in respect of the Indian Mutiny and were published 1911. Mutiny Records Reports [Vol.8] Pt.1, Mutiny Records Reports [Vol.8] Pt.2. Archive.org. Public Library of India Collection. The Indian Mutiny In Perspective by Lieut-General Sir George MacMunn (reprint edition) first published 1931 Archive.org, Digital Library of India Collection. Fatehgarh And The Mutiny by F R Cosens (and C L Wallace) 1933 Archive.org, Public Library of India Collection. "East India (Troops and Police)". Correspondence relative to the grant of the Medal to the Troops and Police employed in Suppressing the Mutiny and Rebellion in the Bombay Presidency. With Medal Rolls and details of some of the actions. Accounts and papers of the House of Commons Volume XXXVIII. Ordered to be printed 17 May 1865. Google Books. "Notes on the History and Services of the Thirty-Second Regiment" The middle parts of this article, are available as follows: page 114, page 218, page 299. Unfortunately, the earlier and later parts of this article in earlier and later volumes are not available online. They are however, available at the British Library. Up Among the Pandies: Or, A Year's Service in India by Lieut. Vivian Dering Majendie, Royal Artillery. 1859 Google Books. The author left England after the outbreak of the Indian Mutiny. A Memoir, Letters, and Diary of the Rev. Henry S. Polehampton, Chaplain of Lucknow ed. by E. and T.S. Polehampton. 2nd edition 1858 HathiTrust with 3 images (rotatable); Third edition 1859 clear text but no illustrations. Archive.org. He arrived in India 1856. Appointed to Lucknow. Wounded and died during the Siege of Lucknow July 1857. Cavalry Experiences and Leaves from My Journal by Colonel H A Ouvry 1892 Archive.org. The author was with the 9th Lancers, and for a period with Irregular Cavalry. His Indian Mutiny experiences commence page 127. His wife's account follows. A Lady's Diary Before and During the Indian Mutiny by M H Ouvry 1892 Archive.org. The author 's husband wrote the book above. Gunner Jingo's Jubilee by Major-General T Bland Strange. Late Royal Artillery 1893 Archive.org. Born 1831 in Meerut he subsequently came to India when the Indian Mutiny broke out (page 129). Contents Thomas Bland Strange Wikipedia. “Strange, Thomas Bland” by Roderick C. Macleod in Dictionary of Canadian Biography, vol. 15, University of Toronto/Université Laval, 2003. "The Indian Mutiny", page 121, Recollections of a Military Life by General Sir John Adye , RA 1895 Archive.org. He came to India when the Indian Mutiny broke out, and was in India nearly nine years. Incidents in India and Memories of the Mutiny, with some records of Alexander's Horse and the 1st Bengal Cavalry Edited by F W Pitt 1896 Archive.org. The subject of the book is General W R E Alexander, a Commander of the 1st Bengal Cavalry. General Sir Richard Meade and the Feudatory States of Central and Southern India; a record of forty-three year's service as Soldier, Political Officer and Administrator by Thomas Henry Thornton 1898 Archive.org. Born 1821, Sir Richard served in the Bengal Army from 1838 for nearly twenty years. At the outbreak of the Indian Mutiny he was Brigade-Major of the Gwalior Contingent which mutinied. He later raised Meade’s Horse. Subsequently in 1859 he was appointed Political Agent at Gwalior, finally retiring in March 1881. Sepoy Mutiny page 107 Recollections of thirty-nine years in the Army by Sir Charles Alexander Gordon, Surgeon- General 1898 Archive.org. He was then a surgeon with the 10th Regiment of Foot. Joseph Fahrer of the Bengal Medical Service was the Residency Surgeon at Lucknow from 1853 and attended Sir Henry Lawrence when mortally wounded. His account of the Mutiny period is from Recollections of My Life, page 130 by Surgeon-General Sir Joseph Fayrer 1900 Archive.org. From Midshipman to Field Marshal, Volume I by Evelyn Wood 1906 Archive.org. He arrived in India in December 1857 page 118 and took part in operations in Central India, where he was awarded the Victoria Cross. 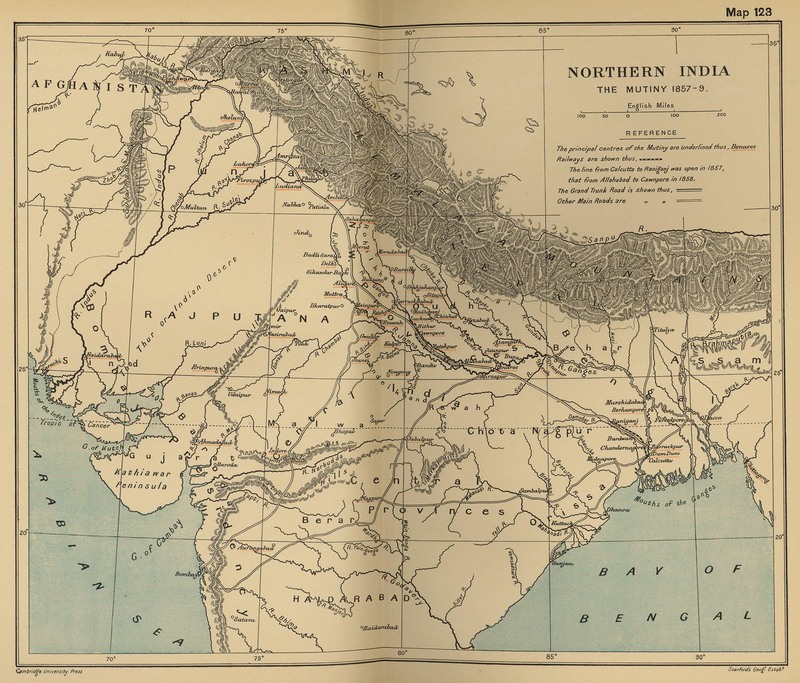 The Revolt in Hindustan, 1857-59 by Sir Evelyn Wood 1908 Archive.org. Based on a series of articles in The Times in October 1907. A varied life: a record of military and civil service, of sport and of travel in India, Central Asia and Persia 1849 -1902 by Gen. Sir Thomas Edward Gordon. 1906 Archive.org. He became on attachment, 2nd in command, and then in command, of the 7th Punjab Infantry, Bengal Army for approximately 20 months, during the Indian Mutiny, page 21, on active service near Cawnpore. The Mutiny, page 48 Incidents and Anecdotes in the Life of Lieut.-General Sprot Volume 1 1906 Archive.org. The author was located in Central India. Duty and Danger in India edited by Herbert Strang. Reprinted 1917, catalogued 1911. Archive.org. From the series The Romance of the World. An anthology, part Indian Mutiny accounts, part Hunting accounts. 'China Jim', Incidents and Adventures in the Life of an Indian Mutiny Veteran by Major General J T Harris 1912 Archive.org. He joined the Bengal Army in 1849. He probably retired c late 1870s. He took part in the 2nd Burma War, the Indian Mutiny and the 2nd China War. Cover title: A Naval Cadet with H.M.S. Shannon Brigade in India: Journal of Edward Spencer Watson. Title page Journal. India: with H.M.S. "Shannon", Naval Brigade, from August 18th, 1858. Note however, there appears to be a typographical error, as correct date should be 1857. Catalogued as published 1858. Google Books. Also see Fiction below for a novel, The Devil's Wind by Maj. Gen.G.L. Verney, concerning the Shannon's Brigade. See Pearl's Naval Brigade for the force which took part in some actions with Shannon's Brigade. Our real danger in India by C Forjett, late Commissioner of Police of Bombay c 1877. Archive.org. Includes the author’s views on the causes of the Mutiny and his part in the preventative and precautionary measures taken in Bombay during the Mutiny. The Personal Adventures and Experiences of a Magistrate During the Rise, Progress, and Suppression of the Indian Mutiny by Mark Thornhill 1884 Archive.org. Also available as a current reprint by Cambridge University Press Preview Google Books. Chapter VI, page 198 Reminiscences of an Indian Official by General Sir Orfeur Cavenagh 1884 Archive.org. The measures taken in Calcutta during the Mutiny. Daily Life during the Indian Mutiny : Personal Experiences of 1857 by J W Sherer [former Magistrate of Futtehpore, and afterwards Cawnpore] 1910 (later reprint edition). Archive.org. Text previously appeared in Colonel F C Maude’s Memories of the Mutiny 1894, refer above. See the page Herbert Benjamin Edwardes‎ for online books about his role as Commissioner of Peshawar during the Indian Mutiny. The Devils Wind by Maj. Gen. G.L. Verney 1956. Pdf download, Digital Library of India. Archive.org version. An account of the actions of the Naval Brigade of H.M.S. Shannon, which participated in the Relief of Lucknow, told through the eyes of a very young sailor. Shadow of the Moon by M.M. Kaye 1980, 2nd file both Archive.org Lending Library. Originally published in 1957 with much of the historical content cut by the publisher, republished in its original form restored to its full length in 1980, following the great success of the author's 1978 book The Far Pavilions. Childhood in India; or, English Children in the East by the wife of an officer, late of H.M. service 1865 (Google Books) . A Tale for Children "Founded on Fact" based on the experiences of a family in India during the Mutiny of 1857. Begumbagh A Tale of the Indian Mutiny by George Manville Fenn 1879 Archive.org. George Manville Fenn 1831-1909, was a prolific writer of boys' adventure stories. Gil the Gunner; or The Youngest Officer in the East by George Manville Fenn 1892 Archive.org. A boys’ adventure story about a young officer in the Bengal Horse Artillery. The Disputed V.C. : a Tale of the Indian Mutiny by Frederick P Gibbon, c 1894 Archive.org. A boys’ adventure story. Barclay of the Guides by Herbert Strang probably 1908. HathiTrust Digital Library. 1928 reprint of 1908 original Gutenberg.org. Archive.org version. An adventure story for younger readers. Chaloner of the Bengal Cavalry: a Tale of the Indian Mutiny by Percival Lancaster R E. 1915 Archive.org An adventure story for younger readers. ↑ Snook, Mike. How did new troops get to Roorkee in 1858? Victorian Wars Forum 3 August 2017. Retrieved 19 August 2017. ↑ History of the Royal and Indian Artillery in the Mutiny of 1857 by Julian R J Jocelyn. Naval & Military Press reprint edition. ↑ peterharrington.co.uk. Accessed 21 September 2016. This page was last edited on 14 March 2019, at 11:59.